Monir Vakili (December 19, 1923, in Tabriz,Iran - February 28, 1983, in Belgium) was an Iranian singer. Monir was born to a family of art and music enthusiasts. Her father encouraged her love of opera and supported her decision to study abroad. Monir studied voice and theConservatoire National de Paris and continued her training in opera directing at the New England Conservatory of Music in the U.S. A pioneer in the true sense, Monir started the very first opera company in Iran. She gave memorable performances as Madama Butterfly, Mimi in La Bohème, Violetta in La Traviata, Liu in Turandot, and many others at the Rudaki Hall. Her passion was to bring the level of artistry in Iran up to international standards. Among many other highlights in her illustrious career she produced and hosted a series in the National Iranian Televisionfeaturing the best selections from Rudaki Hall; she created an opera film festival which was the first of its kind in the world and established the Academy of Voice, a government-funded, co-ed boarding school to educate and train students in the art of opera and choral singing. 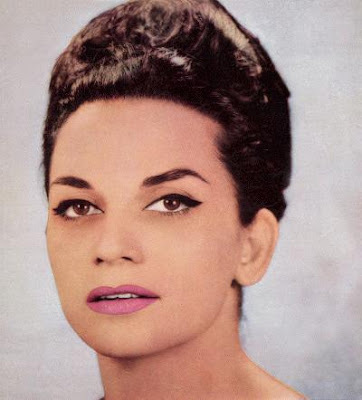 In 1951 Monir placed 1st at the Berlin Youth Festival (vocal category) and in 1975 she was the recipient of the prestigious Forough Farrokhzad Award. Throughout Monir’s life, her love for her country permeated all of her work. A manifestation of this love is an album recorded in Paris in 1958, of songs from different regions of Iran. She dazzled the public and international critics with her performance, and the album, Chants et Danses de Perse, won the Grand Prix du Disque of the Académie Charles Cros. Monir died in 1983. The memory of her ever-lasting spirit and talent lives on in Baazgasht (“Resurrection”), a glorious rendition of the 1958 award-winning album. Biographical Notes Monir attended American School in Hamedan where she performed as soloist and member of the church choir. Radio Tehran and Association of Friends of the French Culture-Soloist and Choir Member, 1969-71. Studied at the Conservatoire Nationale de Musique de Paris 1949-1952, majoring in Operatic Singing and Performing Arts. Recipient of the Best Folk Songs Award, Berlin Youth Festival, 1951. Vocal Coach at Tehran National Conservatory of Music, 1955-57. Recitals at the French Institute and Roumanian Embassy, Tehran, 1955-56. Studied at theNew England Conservatory in Boston, Massachusetts, 1960-61. Majored in Opera Directing. First Persian singer to popularize Persian Folk Songs in Iran and the international music scene. Founder of the first Opera Company of Tehran. Staged the first televised opera scenes from Madama Butterfly and La Traviata on Sabet Television, May 1961. Executive Director of Rudaki Hall Programs for NIRTV (Performing Arts Program), Tehran, Iran. Creator and Founder of the Academy of Voice, Tehran, Iran, 1975 (government funded co-ed boarding high school for opera and choral singing). Recipient of the Forough FarrokhzadAward, 1976. Executive Producer of the first Opera Film Festival in the world at the Rudaki Hall in Tehran, Iran, 1977. Executive Director & Producer & Host of the Television Program for NIRTV: Rudaki Hall Presents (the best programs of the year were telecast all over the country). Appeared in 19 operas as the lead or second lead and directed two major operas in Tehran. Member of Board of Directors : The International Shiraz Arts Festival Toured and performed extensively in Russia, Tajikestan, Bulgaria, Romania, France, Germany, Italy and the United States. Married to Dr. Abdol-Madjid Madjidi, 2 daughters: Scheherazade (a.k.a. ZaZa) and Djamileh. Died in a tragic car accident in Belgium Feb. 28, 1983 as her husband’s car collided with a tank. They had been driving to an informal gathering with prominent diplomats.